Being excluded from the repertoire of the string quartet, the bass player might still be called in for an odd constellation here and there. The challenges offered to us in chamber music however are not equal to those given the other string instruments. In orchestration theory the novelty of the 4 part pizz in H. Berlioz' Fantastique March or the Db-chord ending of Dvorak's second mov of symph no 9 in e minor is sometimes mentioned. R Strauss in Also Sprach Zarathustra and other divisi places lets us hear a quartet of double basses but the truth is: a quartet of double basses is more or less lost in the surrounding of the orchestra. To be heard there needs to be almost nothing else going on at the same time. So a bass quartet playing on its own is the way to go, perhaps, if we are to enjoy this very special sound and experience. 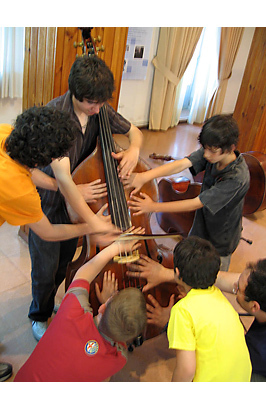 By now the repertoire has grown substantially and the concept is being used also to train double bass players in higher education around the world. My own contributions are 2 Quartets and some smaller pieces and arrangements. The Quartet no 1 has been recorded twice; by the Frankfurter Kontrabassquartett and by the Bottesini Double-Bass Quartet. 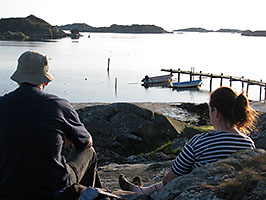 Also, I have recently found an old recording made by colleagues and myself in Gothenburg back in 1987, available for you here. 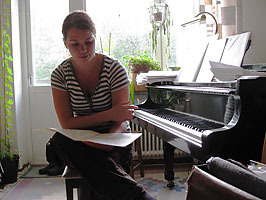 There is no commercial recording of the second quartet yet but you can listen to it here in an attractive version recorded by students of Caroline Emery in England 2004. They called themselves the Phoenix Quartet. 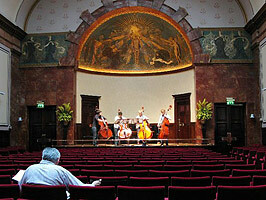 The Quartet no 1 was played in Wigmore Hall summer 2010 by a quartet from the Yehudi Menuhin school outside of London. For young players I have written the ABC Trios and Q for Salamanca. Add your own recording to my pages! Listen to a quartet from the Yehudi Menuhin school rehearsing for their Wigmore Hall debute.